Photo items are hand-selected by the photographer for their beauty, quality, and style. If you have questions or would like to place an order from your photo session, simply email me. Prints may be ordered alone or matted and framed ready to hang. Mats are available in white, black or grey. Frames are available in slim 1-1/4" wide contemporary flat black or white frame. Your finished art piece will arrive complete with matted print, an acrylic front, a finished backing and hanging hardware - ready to show off and display right away. Additional framing styles available on request. These playful, multi-dimensional image cubes are the perfect addition to your desk or table! Each cube is 4"x4" and features your favorite four to five images mounted to a 6-sided wooden block and laminated for longevity. The top and bottom panel can be feature any solid color, names or a personal message from you to your gift recipient. Cubes are just $80 each including shipping. Want to create an even larger impact? 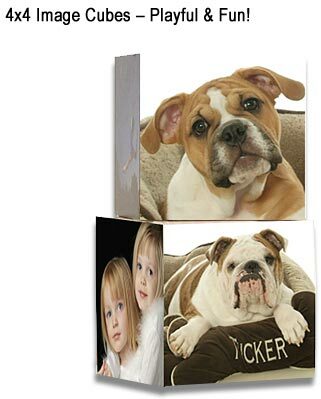 Order an 8x8 image cube for just $120 including shipping. 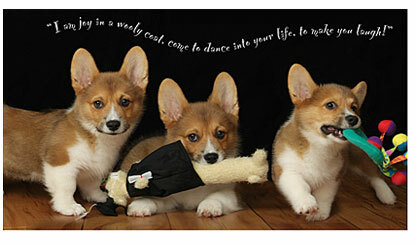 Show off your pets on the cover of these adorable 5x7 folded note cards - so cute, your friends won't believe their eyes! All cards in the set feature the same glossy cover image and can be ordered blank on the inside perfect for handwriting your own notes or with an imprint displaying your custom greeting. Cards include 5x7 white mailing envelopes. 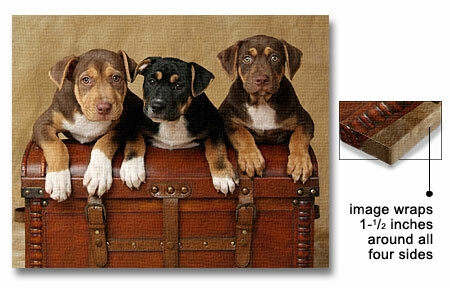 These fun, glossy 5-1/2 x 4" photo greeting cards are the perfectly petite way to show off your family and pets! Your cards can include a printed message on the inside, or leave them blank for handwriting your own notes. White mailing envelopes are included. 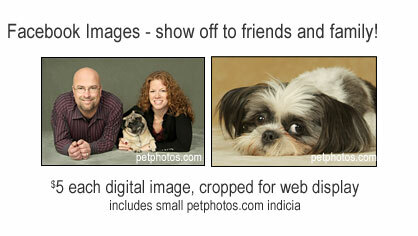 Cards are available for both vertical and horizontal images. These glossy, square cards really make a visual impact! Your 5x5 folded cards can include a message printed on the inside of the cards, or simply leave blank and handwrite your own notes. White mailing envelopes are included in either 5x5 or 5x6. Please note that square envelopes do require an additional postage surcharge at the time of mailing. Turn your pictures into works of art! 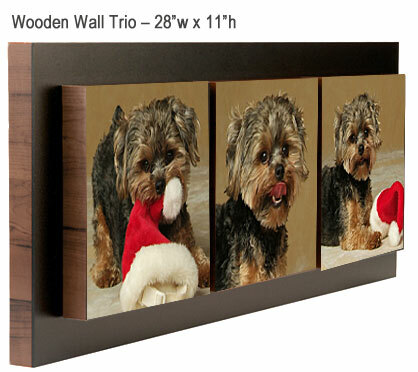 Your favorite image is printed onto a fine art canvas and wrapped around 1-1/2" wooden stretcher bars. The gallery wrapping technique extends your image around all four sides of the canvas, allowing you to show off your print without framing. Each fine art canvas features a laminate coating applied to the surface, which provides UV protection while also protecting your images from scuffs and scratches. Your finished fine art canvas print will arrive completely ready to hang - adding a distinguished look to any room. Want to display your canvas print in a frame? 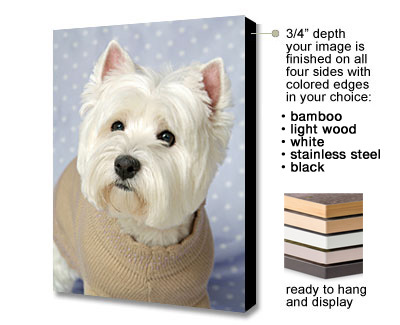 Canvas prints can be matted to the next larger size, ready to slip into your own favorite frame. Contact me to inquire about options and pricing. Make a BOLD statement when your favorite trio of images are printed at a stunning 8x8" size and mounted side by side onto 1" thick wooden blocks, which are also mounted to a 1" thick solid wooden base. This art piece is strong and durable, measuring approximately 28"w x 11" h and weighing about 9 pounds. Mounting hardware is included, $280 price includes shipping. The ultimate in contemporary flair! Your favorite images are lustre coated, then mounted onto an extremely LIGHTWEIGHT foamboard and trimmed with a colored edge creating a finished art piece that literally stands out from the wall 3/4". Select a vertical or horizontal orientation, and hang your Standout Prints on the wall. Holes are added to the backside making it ready to hang as soon as it arrives without the need for glass, matting or framing. The larger 20x24 and 24x30 sizes feature an even deeper 1-1/2" standout. Edging options include: bamboo, light wood, white, stainless steel and black. One of a kind! Select your favorite 3 images to become a petite 10x20" poster that can be displayed vertically or horizontally with pet names or a phrase. Shop for your own poster frame and slip the print right inside - OR- order your poster in the ready-to-hang Standout format with a 3/4" depth black border around all four sides of the image and create a dramatic presentation that is sure to make them say "WOW!" Payment in full is required to place all orders. Pricing does not include shipping, unless indicated, and is subject to change at any time. Completed orders will sent via postal mail or UPS.